Monasteries of Gelugpa (or Yellow Hat Sect) in Tibet. Also called the Heap of Glory, the monastery is located at the foot of Drolmari (Tara's Mountain), Shigatse. Founded by the First Dailai Lama in 1447, the monastery's structure was expanded by the Fourth and successive Panchen Lamas. Tashilhunpo Monastery covers an area of nearly 300,000 square meters (3,229,279 sq. ft.). The main structures found in the Tashilhunpo Monastery are The Maitreya Chapel, The Panchen Lama's Palace and The Kelsang Temple. Tashilhunpo is the seat of the Panchen Lama since the Fourth Panchen Lama took charge in the monastery, and there are now nearly 800 lamas. 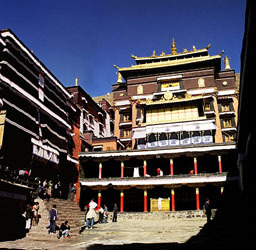 Standing on the entrance of Tashilhunpo, visitors can see the grand buildings with golden roofs and white walls. The remarkable Thangka Wall which is nine floors high was built by the First Dalai Lama in 1468. The wall displays the images of Buddha on the 14th, 15th and 16th of May every year following the Tibetan Lunar Calendar. The images are so humongous that one can easily see it in Shigatse City. Visitors can find The Maitreya Chapel by strolling into the monastery on the west side of Tashilhunpo. One can find the biggest statue of a sitting Maitreya Buddha inside the chapel. The statue stands 26.2 meters (86 ft) high and is decorated with gold, copper, pearl, amber, coral, diamond and other precious stones. The statue was handcrafted by 900 craftsmen in 9 years. The chapel has been divided into five floors. Visitors can tour the upper floors of the chapel using a wooden staircase to see the statue more clearly and appreciate the superb skill of the Tibetans. The Kelsang Temple is one of the oldest and biggest buildings in Tashilhunpo. It is a colossal compound. The Main Chanting Hall is a place for lamas to learn the sutras and listen to the Panchen Lama's sermon. On the back end of the hall lies a 5 meters (16 ft) high statue of Sakyamuni. It is said that a part of Sakyamuni's relics was placed in it. Two chapels sit on both sides of the Main Chanting Hall. The left one is devoted to Tara, the goddess who is believed to be the avatar of Avalokitesvara. A White Tara is in the middle and two Green Taras on each side. The right chapel is dedicated to Maitreya Buddha. With a height of 11 meters (36 ft), one can find the statue of Maitreya Buddha in the middle of the chapel. The statues of Avalokitesvara and Bodhisattva Manjusri created by the First Dalai Lama stands near the statue of Maitreya Buddha. The Great Courtyard of the Kelsang Temple is the place for lamas to practice and debate. The wall around the courtyard is covered by thousands of images of Sakyamuni in different postures and expressions. 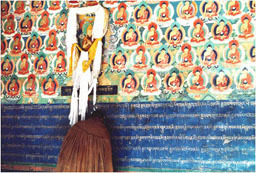 statues, the Tashilhunpo Monastery also treasures characteristic wall paintings. Because of the variety of shapes, resplendent colors and exquisite painting, the murals are considered to be another masterpiece of Buddhist art. Rare sutras, thangka, china and glass services of the Ming (1368-1644) and Qing Dynasties (1644-1911) are also invaluable assets found in the monastery. These are good relics for researching the history and society of Tibet. 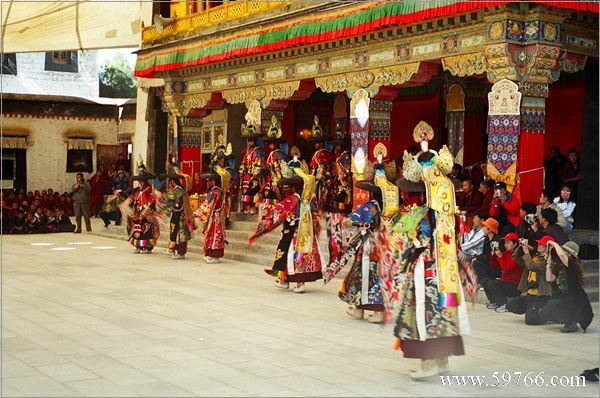 If you come across some important Tibetan festivals, such as Tibetan New Year and Dancing Deity Festival, you may enter the monastery for free. If you want to take pictures inside the palace, please ask politely the lamas. It's easy to be lost in the grand palace, so please be careful! The Tashilhunpo Monastery is situated at the west part of Shigatse City; you can take a walk to the monastery or you could opt to travel by pedicab.